Knowing the proper way to tuck carpet against new hardwood floors can make the difference from not only appearance but avoiding a trip hazard. If you've decided on keeping the existing carpet in some areas where it meets up with the wood floor, here are some pointers for you. First, when removing the old make sure both the carpet and carpet padding extend over the area where the two floor coverings will meet when you begin ripping up the old carpet. There's nothing worse than finding your rushed tear out job has the carpet a half inch short of the hardwood. 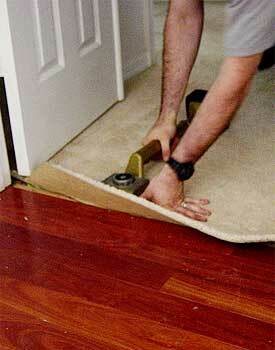 Our suggestion; allow a good four inches of carpet past the middle of the door when it is closed. 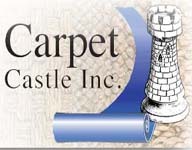 Professional carpet installers typically run a seam that connects two pieces in the center of the doorway. This was the case here as well. 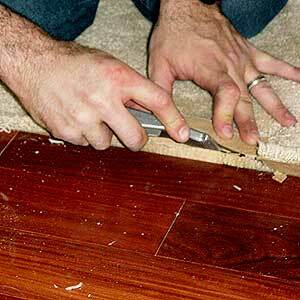 Cutting through carpet seams can be a real bugger if you don't have the proper tools. Special carpet cutting blades should be used for this job. Be careful, the blades are extremely sharp. Next step is attaching the carpet strip near the finished wood floor. You may be wondering; where's the threshold? 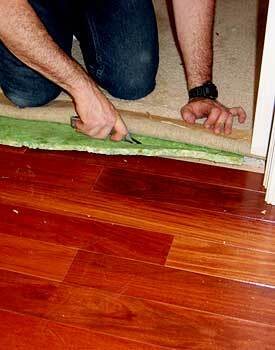 Better quality hardwood installations don't require thresholds unless it's a floating floor. A sleeker looking appearance is hardwood without transitions against carpeted areas. Carpet tack strip comes in basically two varieties. One is designed for installation on concrete and the other for wood subfloors. The only difference is the type of nails. Concrete tack strip uses hardened steel nails that can penetrate concrete. When installing the strip, fold back the carpet and pad so it's out of the way and place the strip approximately 1/2" away from the finished wood floor. 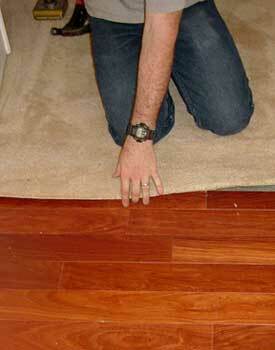 For thinner carpet you may want to place it closer and vice versa for thicker carpeting. The gap (gulley) is where the end of the cut carpeting will tuck into. Often this can be the most daunting part of the job because there may be limited work room, and you certainly don't want to ding up that brand new floor! You may want to practice a few times in another area just to get the hang of it. Considering the concrete nails are only about 3/4 of one inch long it only takes a few whacks to send them home. Good job, now we're onto the next step; cutting back the carpet padding. Unfortunately we don't have a good close-up of this one but you want to fold the padding back over the recently installed tack strip. With a sharp carpet blade cut the padding back about 1/4" inch from the tack strip. Cutting too much away can leave a telegraph effect in the carpet over time with wear and cutting too long can have an effect on the carpet staying stretched on the pins of the tack strip. With the right blade it should cut through quite easily. Ah, that ugly looking knee buster is next! It should be noted, the carpet kicker should not be used to stretch large areas of carpet. Backing up to the point of when the carpet was removed. It's wise to keep as much stretch as possible in all existing areas where the carpet will remain, unless you plan on the services of a professional installer to handle finishing off the carpet. If you haven't removed much of the stretched area, fold back the carpet over the tack strip while placing most of your weight with hand over the tack strip area. You don't have to kick hard to get the carpet nudged. Basically we just want a firm appearance on the other side of the wood floor. 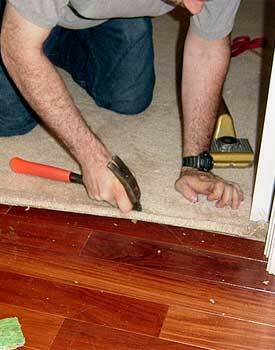 While nudging, place pressure on the carpet so it hinges to the pins of the tack strip. Working right to left in this case nudging every four or five inches along the length of the door opening, keep the pressure on the tack strip area, making sure it has grabbed and stays there. Every installer is different and may have alternate methods of doing this project. I know, I've heard the insane bickering. Geez guys, you're different and the results are the same, why bother? In our case the installer has kicked/nudged the carpet from right to left in the doorway. For better assurance of keeping the stretch intact, the installer in this case rubs with pressure the blunt end of a clean hammer so the pins are hinged to the carpet and will not loosen. Finally more tricky stuff, cutting the carpet to the correct length. I've seen guys do this different as well. From just placing the blade in the gulley and cutting straight across... to well...like I said they all do things differently. 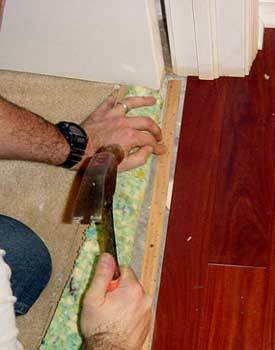 In our case the installer has notched out the middle of the carpet that overhangs the hardwood to begin cutting it back. This actually gives you more control rather than starting to cut at the door casing with limited room to actually start the cut. 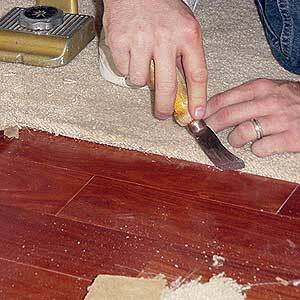 How much to remove will depend on the thickness of the carpet and how much can be tucked into the gulley between the carpet strip and wood. In this case one quarter if an inch or so is actually left overlapping the hardwood; ideal for a good quality carpet tuck. Some installers will add a bead of latex in the gulley before the next step. Latex will hold the rough cut end of the carpet intact much better, preventing possible fraying of ends and loosening of the edge in the gulley itself.